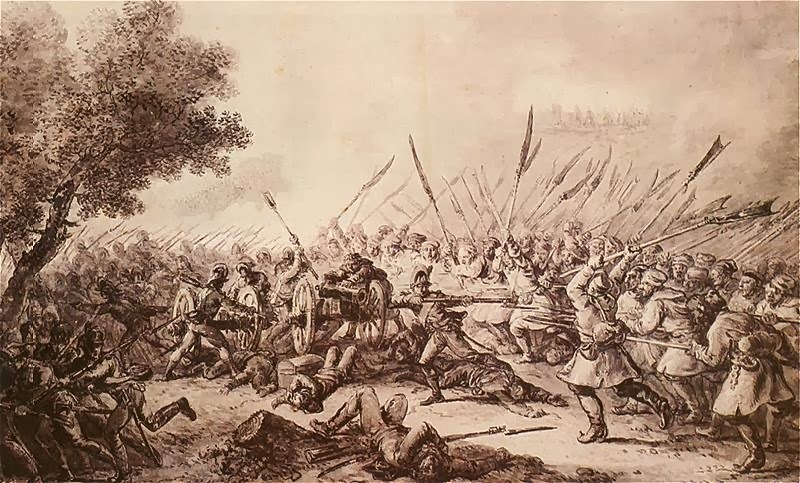 Well, I would like to start showing my photos of this masterpiece, its painters and the events taking place on canvas, as this is a historical piece describing some of the vents that took place during the battle of Racławice, AD1794..
Wojciech Kossak got together to paint this cycloramic painting, being influenced by similar works painted by the Germans ( Anton von Werner in Berlin,) and the French (Alphonse de Neuville & Eduard Detaille in Paris - example of battle of Champigny from gallica ) during 1880s. Also it is very commendable and perhaps astonishing that the Committee, for the Austro-Hungarian State Fair to be held in Lwow (Lviv) in 1894, quickly came about having a design made and construing the necessary building in Lwów. Munich in Bavaria was another center for fine art at that time, and both our painters went there to study the art of painting the panorma. Also they had to order necessary and specially woven canvass (as always from Belgium), study or ask around the circle of miltiray hsitorians about the period uniforms and wepaons, study period art, and visit the locality, i.e., Raclawice village. Kossak painted 4 large oils (1: 10 scale of the original size, they became known as Mała Panorama Racławicka bought by prince Adam Sapieha for his Krasiczyn castle ) in April 1893, and Styka took two of them to Lwow to finish them while Kossak took the remainder to his atellier in Krakow. In July 1893 the building was finised and canvas was streched, all 120 meeters long and 15 meters high. 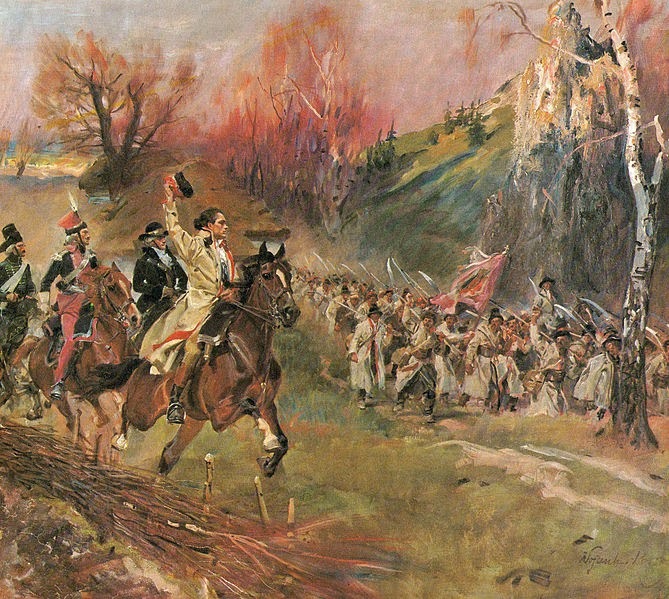 The research for the historical accuracy led them to the Vienna war Office archives where they found a plan of the battle, drawn shortly after the engagement in 1790s.Then Styka, Kosska and Ludwig Boller(from Munich) went to scout the landscape near Racławice, and made landscape sketches. 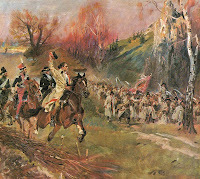 Two historians, Tadeusz Korzon , who finished then a new and monumental biogaphy of Kosciuszko, and Konstanty Górski , military historian, aided them with historic information. also museums in Krakow, Lwów and other private collections around the Austrian Poland (partitions of Poland ) were opened to them to allow for study of the art and material history of the Kosciuszko Uprising. Our two principal painters chose painters to assist them in painting this behemoth: Teodor Axentowicz, already mentioned Ludwig Boller, Tadeusz Popiel, Zygmunt Rozwadowski (great painter of horses), Michał Sozański, Wlodziemierz Tetmajer and Wincenty Wodzinowski. They got to work and worked hard , with many conflicts between the principal artists. 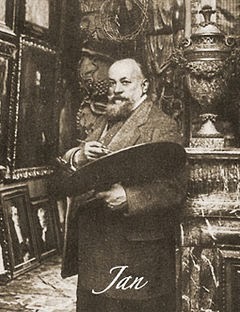 Jan Styka was the mastermind of the project and one who organised it. He painted the praying group, woman with the killed husband before the hut, the mounted figure of Kosciuszko; and with Wlodzimierz Tetmajer he painted 'kosynierzy '(scythe-armed peasant levies) attacking the cannons and troops of regular Polish infantry and peasant levies marching to fight. Wojciech Kossak painted 70 % of all figure composition of the entire panorama (he also painted the horse for mounted Kosciuszko painted by Styka) The landscape was painted by Ludwig Boller and Tadeusz Popiel. 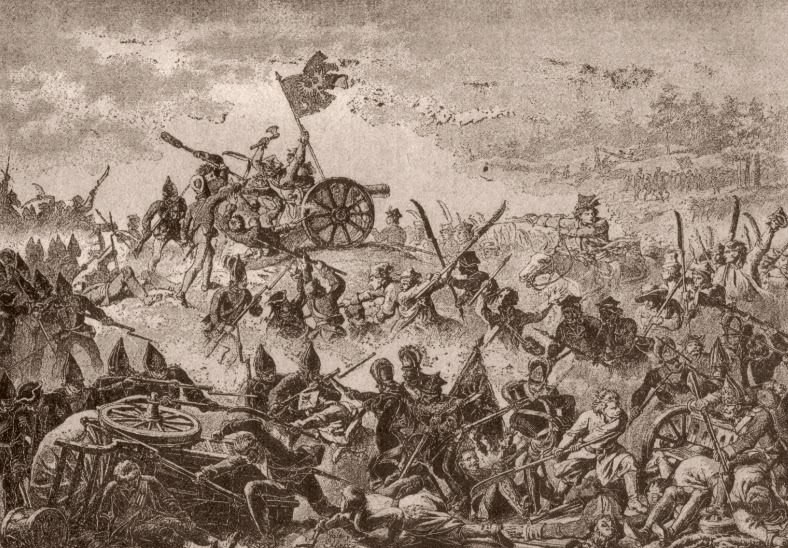 Following Kossak's sketches Teodor Axentowicz painted the infantry of Wodzicki regiment of foot while Zygmunt Rozwadowski National Cavalry regiments. 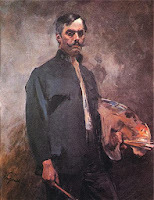 Periodically Wincenty Wodzinowski and Michal Sozanski helped to paint various scenes. After 9 months they finished on May 28 1894, all the rest was added and synchronised with the painting within a week, and on June5, 1894 the panorama opened its doors for the visitors. It survived the World War II, although the Germans tried hard to find it (it was hidden by patriots) and the Soviets agreed that the Polish authorities of Soviet Poland would take possession of this artwork (although countless other works taken from Polish museums and private collections stayed in Ukraine and her museums) was brought to Wrocław (Stalin took Lwow and gave us Wrocław I guess) in 1946, where finally the Communists allowed for the new rotunda built and painting restored. The newly restored Panorama was opened for visitors in 1985 and continues to draw crowds from all over Poland and abroad. After the work was complicated and prises sung, the conflicts between Styka and Kossak grew as to the authorship of the project, and continued for many years. The quarrel never really ceased between the artists, and lived on after 1894, and actually Jan Styka's sons continued with it. Both artists went to paint more panorama paintings, Styka 2 more while Kossak 2 more as well. Theses hudge paintings were cut and sold off as smaller pieces. Hej, z tej strony Remigiusz z Bloga dla Faceta / Oszczędzania - w dziale lifestylowym albo hobby na dlafaceta myślę sobie zahaczyć o Twoją tematykę... może byśmy coś przedstawili moim "facetom" oczywiście z poleceniem Twojego bloga.